Series 1880 Legal Tender Bank Note Value, Information and Worth. 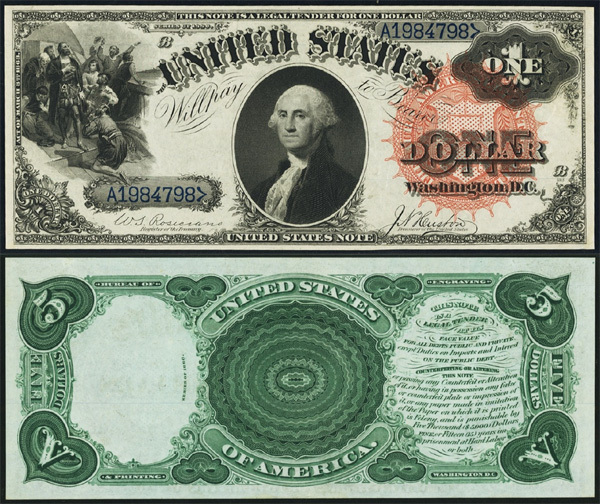 The series 1880 $1 bill can be found in all grades and is not an expensive note generally. There are eight signature combinations for this note. The rarest of which is the Rosencrans - Nebeker The most common signature combination is the Bruce - Wyman. This note comes in various seal colors. Large Brown seal, Large red seal and small red seal. There are roughly 2000 series 1880 $1.00 notes in collector hands so a mid-grade example can be had for a couple hundred dollars. A range of values of this note would be between $75 and $3000 for a perfect example. 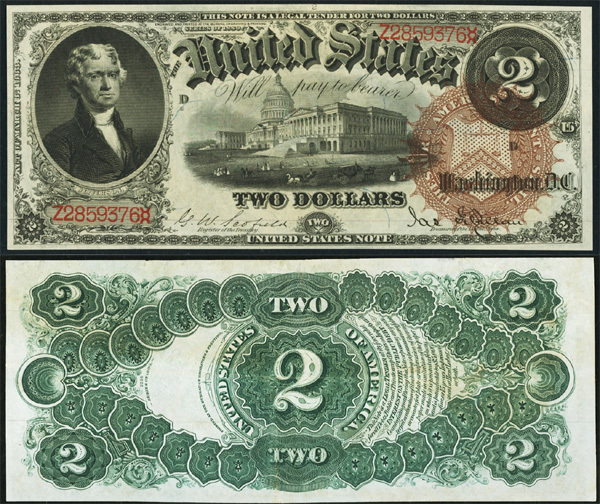 The series 1880 $2 bill can be found in all grades and is a reasonably priced collectible as a result. There are seven signature combinations for the 1880 $2.00. The scarcest signature combination is Rosencranz - Huston. The most common combination is Bruce - Wyman. This note comes in Large Brown seal, Large red seal and small red seal. There are about 1000 series 1880 $2.00 bills known to exist so a mid-grade example only runs a couple dollars. The price range for this note would be between $100 and $3500 for a perfect example.